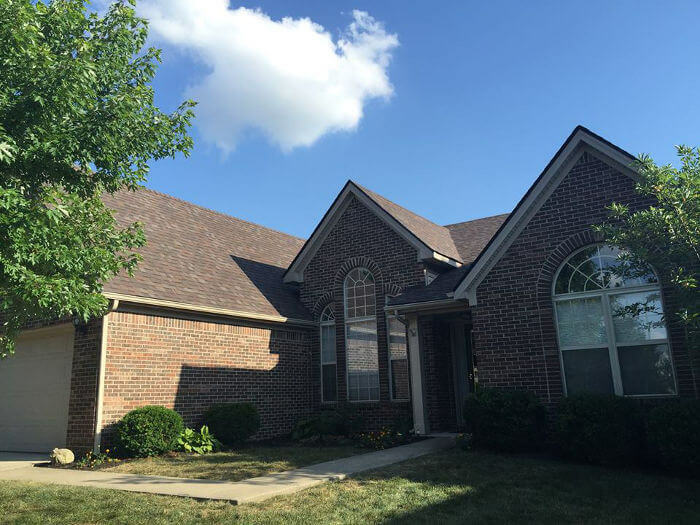 Whether you’re building a new house or it’s just time to replace your roof, we’ve put together some helpful tips on how to choose the best types and colors of shingles for your home in Lexington, KY.
You could easily make this a very complicated decision for yourself. Here, we’ll break it down into some basic steps to help you choose wisely and stay satisfied long term. Call or Request Free Consultation! If you’re like most, you probably just want to dig right in and start comparing colors and styles of shingles. 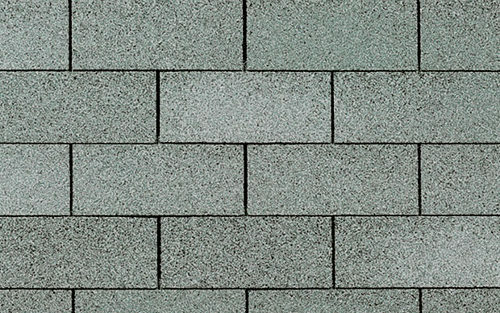 Before you get too excited, we recommend you start by choosing the brand of shingle and products that you’ll want protecting your home. You will be well on your way towards narrowing your decision by taking this first initial step. 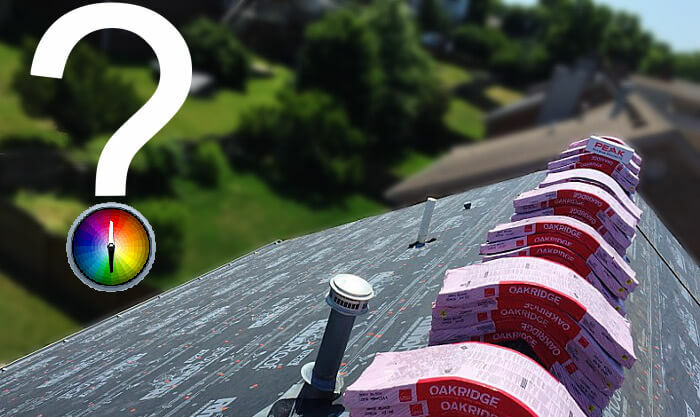 We utilize the Owens Corning brand of shingles and materials. As a preferred contractor, we believe they have proven themselves by delivering durability, performance, beautification and unmatched quality year after year. Originally founded back in the 1930’s, this company has evolved over the years in great measure. By 1977 they began their venture with shingles. To this day they stand as America’s leading provider of roofing materials and products. Beyond Owens Corning’s innovation, they also back their products with some of the nation’s leading warranties. 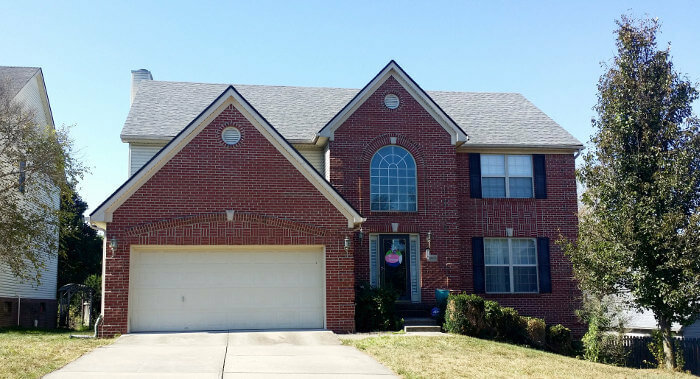 Fact: Because we are an OC preferred contractor, we have the ability to offer better warranties over and above other roof installers in Lexington. By selecting the brand you trust, you’re now one step closer to dialing in on a choice you’ll prefer. When you factor in tried and true versions along with new industry innovations, the different styles of shingles are more diverse than ever. 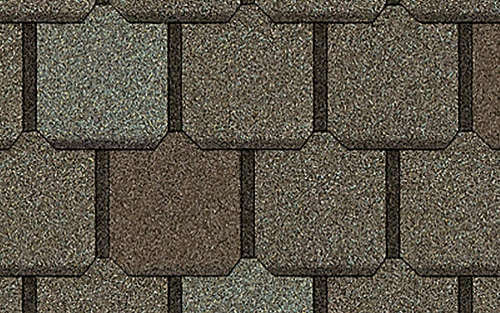 A roofing manufacture may only offer certain colors within any given line or style of shingle. Selecting a style that you prefer should be next on your process of elimination. This will help you to choose from the available colors that are offered within the style. The following includes examples on different styles of shingles to choose from. The 3 tab shingles are probably one of the more recognized original style of shingles. They have been true over the years in performance, but as any product evolves, they are quickly becoming a style of the past. They have a thinner layer of asphalt and often don’t appeal to the more trend envious homeowner. You want something affordable that will still stand up to a fair amount of weather related impacts, while offering a uniformed consistent look. Loosing popularity within certain market trends. This type may end up making your home look outdated compared to your neighbors, which may result in a loss of curb appeal. It also does not provide as much resistance against storms as do the new architectural styles. Architectural shingles are currently the most popular style of shingles on the market. As you drive through neighborhoods in Lexington, you’ll find that these are extremely common. 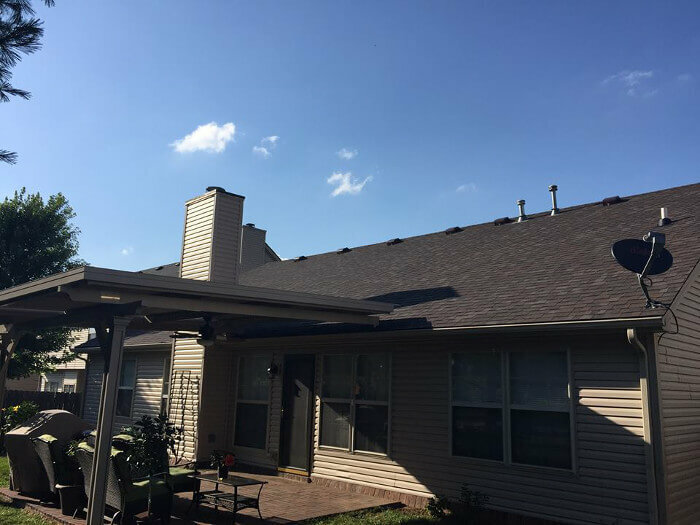 Due to their trendsetting appearance and the superior storm and wind resistances they offer, it has made them the go to choice for almost all new roof replacements. They offer a stronger wind resistance as well as an appealing design that more homeowners are upgrading to vs. the traditional three tab style. Although the cost of this type is higher than 3 tabs, it’s not much more of an investment due to the value and curb appeal they provide. Slate style shingles are a matter of personal taste. Some would say they offer a more elegant look vs. architectural types. These might be a option if you prefer a flatter and smoother look to your home while still desiring quality protection. While comparable to architectural in terms of quality, they won’t provide the most modern appeal, but still provide terrific protection. These generally will require a larger investment and due to a lack of common popularity, they don’t come in a wide range of color selections. Although it’s not a type of shingle, metal roofing is still often a consideration when choosing a type of material to protect your home. If distinguishing your property from your fellow neighbors is your goal, this will definitely do the trick. Metal roofs come in a variety of styles and offer an abundant color selection. They have set the pace for providing homes with a unique look. Longevity accompanied by strong durability make this type of roofing material an ever increasing popular choice. 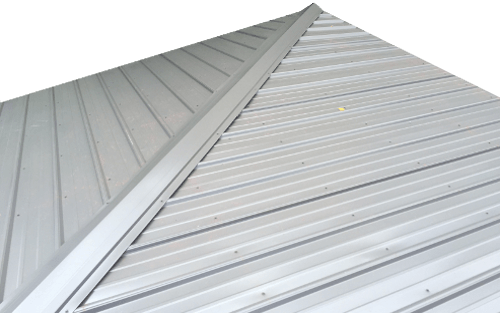 Metal roofs can have a tendency to be known for being noisier during storms such as heavy rains. The costs associated with this type can often be much higher than your typical asphalt/laminate style of shingles. If you’re considering selling your home in the future, you’ll have to decide if having a metal roof is a plus or minus to your favor. Personal styles and tastes can change over time, but when it comes to roofs, once you’ve made your selection, it’s final. So how do you decide on picking a shingle color for your home? Although we can only give you advice, there’s nothing better than driving around town to compare examples on what you prefer! 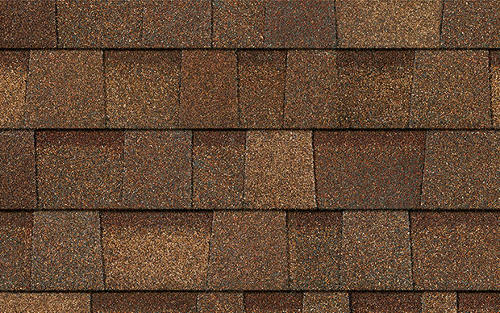 View our shingle color chart examples for a variety of options to compare. Here are some tips to hopefully making this choice easier for you. Tip 1: What is your home’s most dominant exterior material? 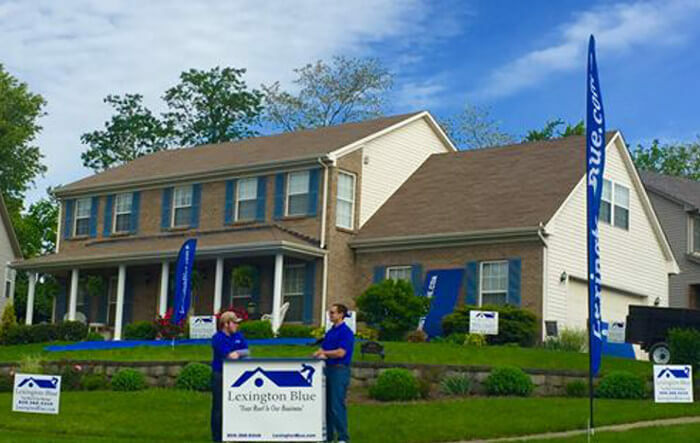 There are many homes in Lexington that have a combination of brick and vinyl siding. If brick is your dominant and more than likely permanent exterior material, we suggest you start your decision based off the brick’s color. You can always change the colors of siding, shutters, gutters, etc., but brick is generally there to stay. Starting with only two (2) colors, the dominant exterior and potential shingle color will help make this decision easier. Tip 2: Decide on the pros & cons of performance. Certain colors can make or break your expectations. While beauty is appealing, performance can save you money and provide comfort. Pros: Light colored shingles will generally help a home to stay cooler during the hot summer months. 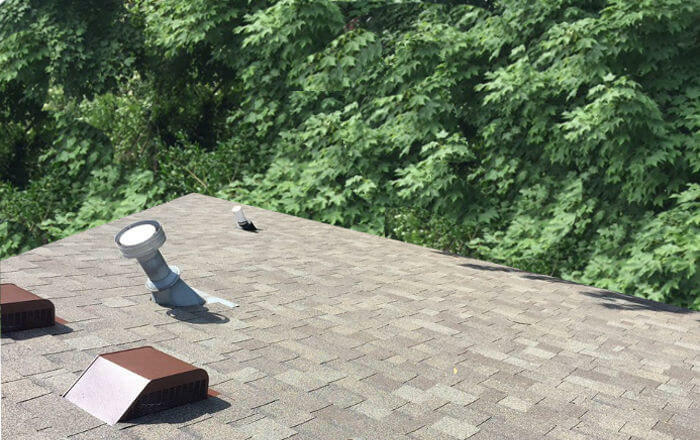 Cons: The lighter the color of your shingle, the more defects and discoloration may set in by showing dirt & mildew. Pros: Darker colored shingles will help to keep a home warmer during the colder months as well as to help lessen the effects of ice damming during winter. Cons: A dark or black shingle will retain a significant amount of heat and may cause your home to stay hotter during the summer. Tip 3: Consider your home’s environment. Factoring the performance outcome may be more important than this tip, but another piece of advice would be to consider the surrounding environment of your home. 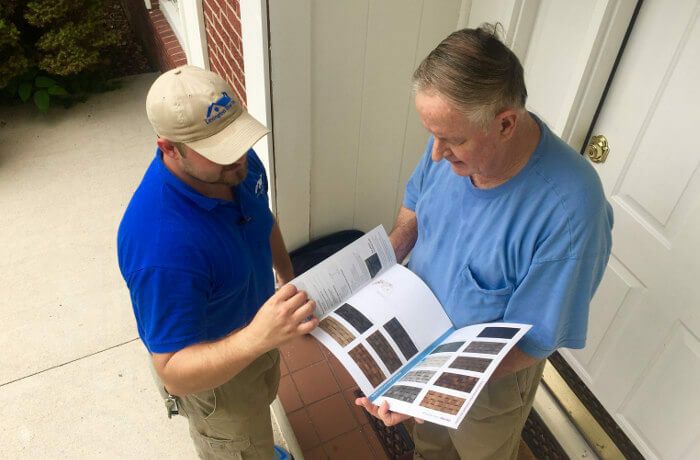 If you’re one of the many residents of Lexington who are living within the suburbs, you might not have too many outside elements other than storms that will affect your shingles. The one possible exception to this would be having an abundance of trees that over hang near your home. Depending on the type of trees, you could have sap, bird droppings and debris falling down on top of your roof. Any one of these elements could cause some type of discoloration. Shade would be another factor, which can help aide in the growth of algae and mildew, especially on the northern side of a roof. Darker colors tend to help reduce noticing the effects of mildew or algae growth. Another consideration would be if you live outside the suburbs within a rural area. Living near a farming community or rock quarry may result in a larger amount of generated dust that can cover your home. Lighter colored shingles will often help hide dirt and dust better than a darker color. If you live within a homeowner’s association be sure to check on the restrictions or requirements of colors & style of shingles you may have to use. Tip 5: Visually compare colors of shingles based on other home’s exterior. This may feel like you’re cheating or lack in your own creativity, but judging colors in real life is hard to beat! We’ve put together some examples for you to compare. Hopefully this will save you some gas money vs. driving around town! Dark red brick house with “sierra gray” colored shingle. Brown brick & beige vinyl sided home with “brownwood” colored shingle. Red & brown brick colored home with “flagstone” colored shingle. Light gray vinyl sided home with “estate gray” colored shingle. Tan vinyl sided home with “driftwood” colored shingle. With an abundance of shingle color options and styles on the market to choose from, it’s easy to become overwhelmed. We understand it is an important decision and one you will have to live with for years to come. Our team has a wealth of experience in this matter. We can help lessen the burden of selection, while more importantly, keep you from hopefully not making a mistake you’ll regret. Color options for shingles are plentiful and a well thought out choice can compliment your home’s appeal. This is where we can help! We can personally assist you in selecting a color. Each one of our project managers have the experience to guide you through this selection. They know what to look for as well as offering advice on how to stand out from the neighbors by complimenting your home’s attractiveness. 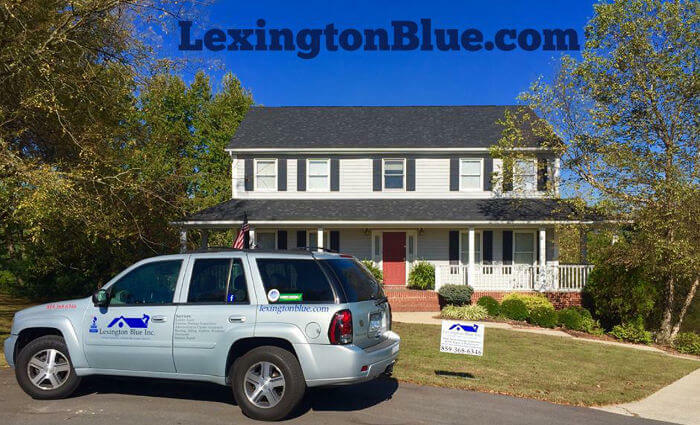 Contact us for even more helpful tips on choosing a color of shingle for your home in Lexington, KY.